In addition to picking up an 11th cog, the Ultegra CS-6800 Cassette is now available in more gear spreads, including a hill conquering 11-32T option. New Hyperglide tooth profiles ensure reliable shifting with the narrower CN-6800 11-speed chain, steel cogs deliver maximum durability, and machined cutouts provide additional weight savings. Claimed weight: 212g (11-23T), 292g (11-32T). 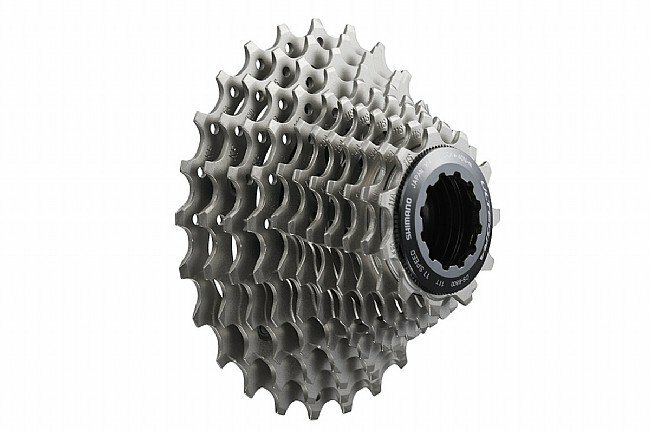 If a particular gearing of the Ultegra CS-6800 Cassette is unavailable, please check over at the new R8000 Cassette. Replaced an friends 11-25 cassette with this one 11-28. Smooth shitfing and climbing made a little easier ! I love Ultegra. Almost all the benefits of Dura Ace, except weight, and much more affordable. And you have the illusion of being just a little better than 105 and with a Di2 option to boot. I am an intermediate rider at best and if I want a lighter, more aero bike, I can accomplish that by dropping 10 or 15 pounds of fat. At 205 pounds I love going uphill because of the thrill of going back down and passing the guys who drop me on the flats. But I'm working on that. The 11-32T option helps me both ways. Quality product at an affordable price at Bike Tires Direct. High quality cassette at reasonable price. Replaced the 11-28 tooth Ultegra cassette with this 11-23 tooth version. Quick and easy change, shifts flawlessly and provides ideal gear ratios for the southern Utah roads. Bike Tires Direct had the best price on the internet. Gone are the days where one(non-pro paying out of pocket) might be tempted to jump on the Dura Ace train. Ultegra cost to benefit os better than ever over Dura Ace. And this applies more than ever to cassete purchases. These 11 speed cassetes are super smooth and will squash any delusions of trying Dura Ace. Biketiresdirect os an excellt outfit to do your purchasing. Product exactly as expected from Shimano and BTD. I mean what can anyone say about a Shimano Ultegra 6800 cassette. They work pretty great. I already owned an 11-32 and 11-28. I wasn't too thrilled with them for some of my super flat crits around Chicago. So I picked up the 11-25 and couldn't be happier. With these three cassettes I feel like I have the right tools to get the job done. 11-25 is going to be great if you want to race without to much elevation change. With the tighter spacing you can shift and find your sweet spot when you are trying to hang in the peloton and waste the minimum energy. 11-28 is going to be a great all around cassette. If you aren't going to be tackling steep grades. But won't be racing either. I don't think you could go wrong with an 11-28. 11-32 is great when you get those steep grades. Couple the 11-32 with a compact crank, you will be get getting up that hill! Other than performance the Ultegra set is a great value for the performance it delivers. If your bike is properly tuned you can expect the components to last while delivering smooth consistent performance.